Eggs are a delicious source of healthy protein and nutritious vitamins and they are very versatile to cook with. You can eat them in many ways, such as scrambled, fried, or cooked in an omelette. One of the most popular ways of eating eggs is hard boiling them. However, many people find this process somewhat difficult and frustrating and end up with broken egg shells, undercooked eggs, and a big mess. Place the eggs in the pan first with the shell on. Run cold water over top of them until the water is one inch above the egg. Don’t try to make too many eggs at once, as this will work better if you do them in small batches. Try to use eggs that you have had for a few days, as they often work better than very fresh eggs. 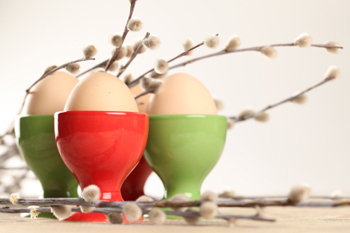 If you store your eggs in the fridge, let them come to room temperature before boiling to help avoid the yolks changing to an unappetizing green colour. The next step is to put the pan on the stove and cook it over a medium heat but only until the point when the water begins to boil. You want to keep the eggs on a medium heat because if they are boiling they can jump around and possibly crack. Adding a pinch of salt to the water will make it easier to peel the eggs once they are finished. The proteins will coagulate and firm up which will help you separate the white from the shell. As soon as it begins to boil, reduce the heat to low. Allow the eggs to simmer for two or three minutes if you would like them to be somewhat soft, or 10-15 minutes if you want hard-boiled eggs. When the time is up, remove the egg with a spoon or a ladle and let it cool. You can run cold water over the shell if you need it to cool down quicker. Be careful not to overcook the eggs. You can tell if they are overcooked if a green ring starts to appear around the egg yolk. This is due to the sulphur and iron inside the egg. It will not make the egg taste terrible, but it will affect the nutritional quality of the protein. How can you test if an egg is done without cracking the shell? The trick is to spin it around on the table like a top. If it turns fast and evenly it is hard boiled, but if it turns slowly and unevenly or wobbles to one side it is still soft boiled. The next step is to peel your egg. Start peeling from the thick end of the egg where you will find a slight indentation underneath the shell which will help you with the peeling process. Don’t forget to peel away the membrane under the shell as well. Now that you have cooked some delicious hard boiled eggs, you can eat them on their own, use them in sandwiches, or make tasty deviled eggs for a plate of snacks for a party. They are a popular, tasty and healthy treat and now that you know how easy it is to make them you can enjoy hard boiled eggs any day of the week! 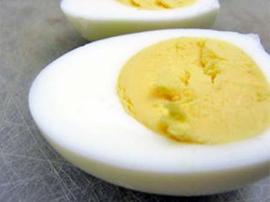 These tips will help you make a perfect hardboiled egg. 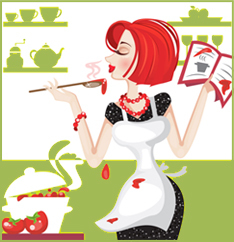 If you want to develop your techniques even further you might want to look into attending cooking schools and learning from expert instructors.